Preheat oven to 350°F. Spread coconut on a rimmed baking sheet and toast until golden brown and fragrant, about 10 minutes. Bring toasted coconut, sugar, honey, and 1/2 cup water to a low boil in a small saucepan. Remove from heat, cover, and let steep at least 30 minutes and up to 4 hours. Strain syrup through a fine-mesh sieve into a small bowl or resealable glass container, pushing down on solids to extract as much syrup as possible. You should have about 1/3 cup. 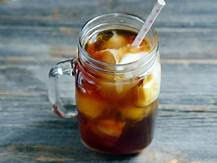 Fill a glass with ice and add cold brew. Stir in desired amount of syrup (about 2 Tbsp.) 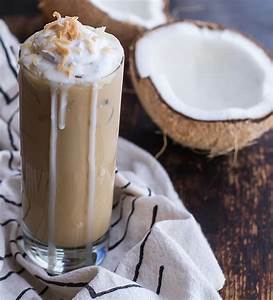 Top with a splash of coconut milk. Toasted coconut syrup can be made 7 days ahead; store in an airtight container and chill.